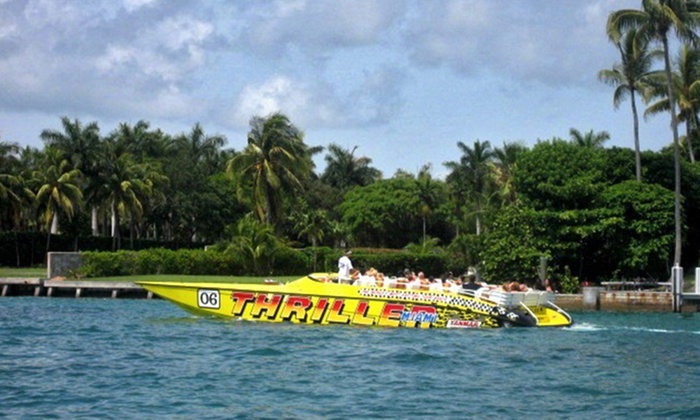 The Miami Speedboat departs from Downtown Miami everyday at varies times. Our thrilling Miami Speedboat Tour lasts 45 minutes, and provides the ultimate sightseeing experience in true "Miami Vice Style". See celebrity homes on Star Island, Fisher Island, Miami Beach and see the Art Deco district of South Beach from Thriller's unique perspective in the Atlantic Ocean. We are the only tour boat that can give you an off-shore experience, covering three times the Miami area as compared to other tour vessels. $38 Per Adult and $24 Per Child (ages 3-11). Children under 3 years old are not permitted on the tour for safety. The Miami Speedboat departs from Downtown Miami. This 45 minute tour provides the ultimate sightseeing experience in true "Miami Vice Style". See celebrity mansions on Star Island, Fisher Island, Miami Beach and see the Art Deco district of South Beach from Thriller's unique perspective in the Atlantic Ocean. We are the only tour boat that can give you an off-shore experience, covering three times the Miami area as compared to other tour vessels. You can park your vehicle at the Bayside Marketplace Garage. The exact address is 401 Biscayne Blvd Miami, Fl 33132. The price depends on how long you stay there for. . Guests prone to motion sickness should take precautions..
WILL WE GET WET ON THIS TOUR? There are times when wind, speed and direction will affect water and sea spray which may enter the boat..
DO YOU ALWAYS GO OUT TO THE OCEAN AND SPEED UP TO 45 - 50 MPH? Most of the times yes, but while every effort is made to ensure a safe and Thriller ride upon our vessel during your trip, the captain will take the sea conditions into consideration before going into the Atlantic Ocean and/or reaching speeds up to 45/50mph. . Yes, but it has to be in a plastic cup or bottle. No glass containers can be taken aboard the boat. .
CAN I BRING FOOD ABOARD? No, food is not permitted on the boat. .
DO YOU CANCEL THE TOUR IF IT'S THUNDERING OR LIGHTENING? Yes, for the safety of our passengers and crew, if it’s thundering and lighting we have to cancel the tour..